This is a pub in a very busy part of Southampton (Oxford Street) which has many good restaurants and bars, but the London Hotel is popular with a varied pub/british menu, friendly, with a great atmosphere. Thursday To Sunday is when it all happens and changes weekly, see listings for details. You wont be disappointed. The London Hotel was built in 1907 on the site of an older pub. Its ornate green tiled exterior makes it very distinctive. The interior is equally impressive, with the bar being an island in the middle; one of only two such pubs in Southampton. The pub sports a nearly full set of etched & bevelled decorative glass windows, any replacements being etched copies. 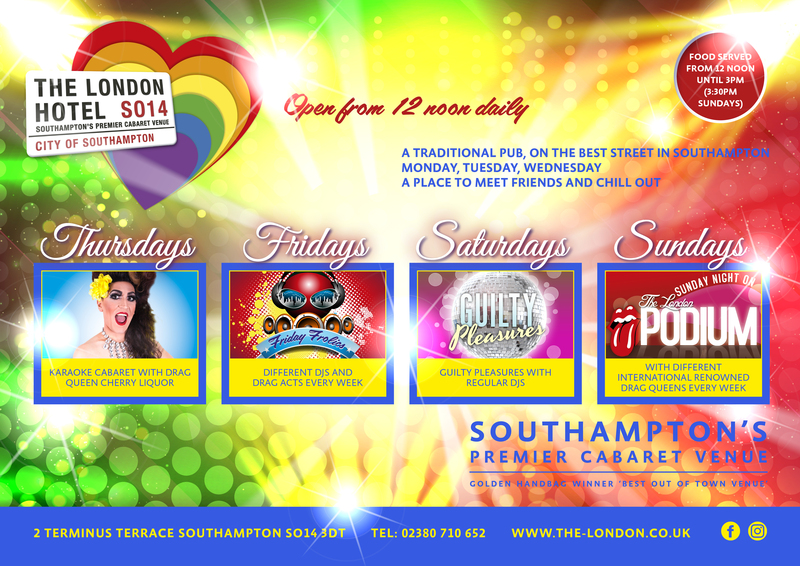 A small stage is the focus for weekend evening entertainments with Karaoke on Thursdays, a DJ on Saturdays, and cabaret & drag acts on Fridays & Sundays – the pub is one of Southampton’s main gay pubs. To the back of the pub is a comfortable lounge alcove, once the pool room. Oxford Street is partially pedestrianised which suits the pub’s outdoor seating on the pavement.